Nobel Peace Prize Day in Oslo dawned with clear and sunny skies on Sunday, but not everyone was celebrating. 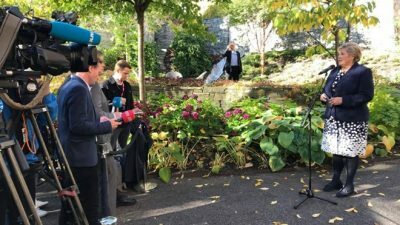 The Norwegian Nobel Committee’s decision to award this year’s Peace Prize to the International Campaign to Abolish Nuclear Weapons (ICAN) challenges Norwegian leaders to finally support a ban themselves, and now pressure is building on them to do so. Growing numbers of Norwegians also see the irony of promoting peace while refusing to ban nuclear weapons, with media commentators, lawyers and professors in Norway calling it “embarrassing,” “un-Norwegian” and equivalent to a lack of understanding of Norway’s international obligations. 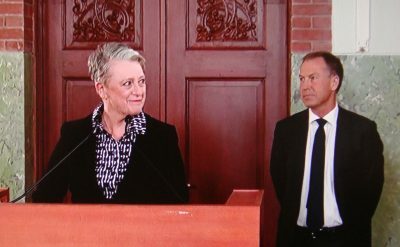 They’ve blasted Børge Brende, who was still Solberg’s foreign minister when the prize was announced, and Ine Eriksen Søreide, who replaced Brende when he resigned to rejoin the World Economic Forum as its new leader. Brende had even tried to get Norway’s former left-center government to support the UN treaty against nuclear weapons when he headed the Norwegian Red Cross, before joining Solberg’s government and changing his position. Norway’s former left-center government, meanwhile, was led by the Norwegian Labour Party’s leader at the time, Jens Stoltenberg, who’s now secretary general of NATO and also opposes a ban on nuclear weapons. 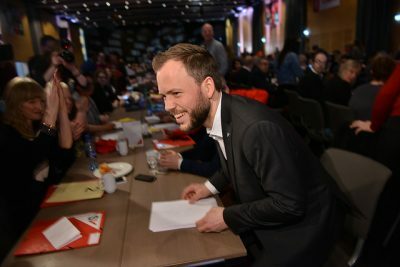 Last week, Lysbakken managed to assemble a majority in the Norwegian Parliament to challenge the current minority Norwegian government’s position. SV, Labour, the Center Party, the Christian Democrats and the Liberal Party agreed to ask the government to study the consequences of a nuclear weapons ban for Norway. It must both analyze the UN treaty’s contents and what consequences it would have for Norway to sign it. The government will have no choice but to do so after the measure is due to be passed in January. Solberg was due to at least attend Sunday’s traditional Nobel Peace Prize ceremony, along with members of her government and Norway’s Royal Family. Some ambassadors from other countries with nuclear weapons, however, were staying away.